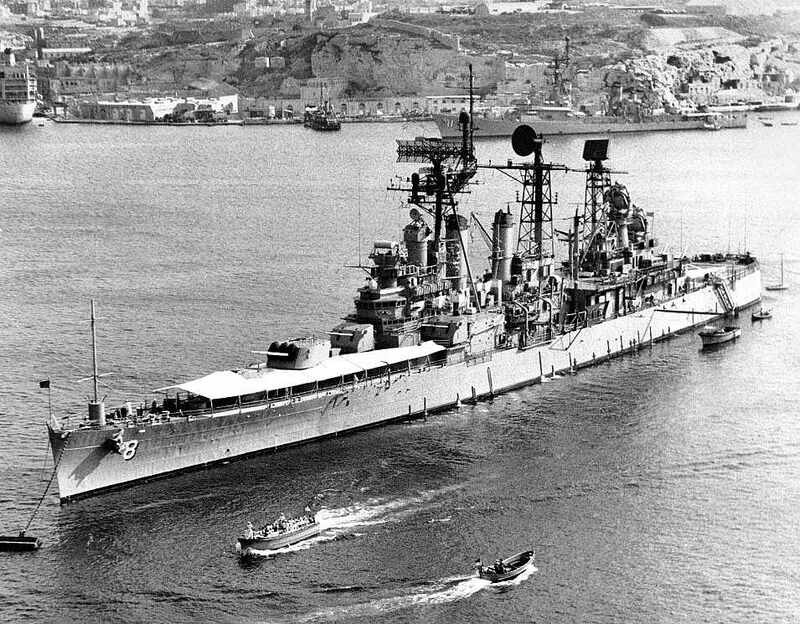 Early in 1957, Topeka was towed from San Francisco to the New York Naval Shipyard that she entered on 15 April to begin conversion to a guided missile cruiser. 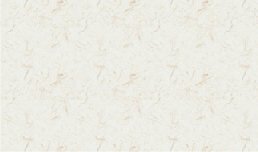 On 23 May, she was officially re-designated, CLG 8. During the almost three years it took to convert her, the cruiser was extensively modified. She retained only half her original gun battery, losing her two after 6-inch triple turrets and her three after 5-inch double mounts. The removal of those guns made room for the installation of her twin Terrier surface-to-air missile launcher and related ancillary equipment. 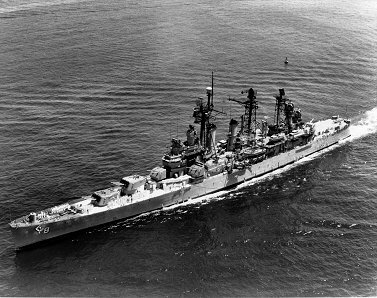 On 26 March 1960, Topeka was re-commissioned, Capt. Frank L. Pinney, Jr., in command. In July, she made the passage from New York to the west coast. From August to October, the refurbished cruiser conducted shakedown training in the southern California operating area and then reported for duty at her home port, Long Beach. During the ensuing three years, Topeka alternated two peacetime deployments to the western Pacific with repair periods and local operations on the west coast. Her two tours in the Orient were characterized by visits to such places as Hong Kong, the Philippines, Okinawa, and a number of ports in Japan as well as exercises with other ships of the 7th Fleet and of Allied navies. When not deployed to the Far East, she conducted training operations, upkeep, and repairs. In March 1964, she embarked upon her third deployment to the western Pacific since being re-commissioned. That deployment began routinely enough with fleet exercises in May and calls at Japanese, Taiwanese, Malaysian, and Philippine ports. 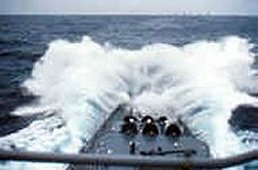 However, in August, North Vietnamese torpedo-boats attacked Maddox (DD 731) on the 2d and then returned to attack Maddox and Turner Joy (DD 951). This action â€” known as the Gulf of Tonkin incident â€” gave the remaining part of Topekaâ€™s deployment a more wartime character. Topeka cruised the waters of the Gulf of Tonkin while American involvement in the Vietnam conflict began to gather a momentum. It was more than a year, though, before she steamed into war in earnest. Late in October, she started for home and reentered Long Beach near the end of the second week of November. For the next 12 months, she viewed the developing war from afar â€” operating out of west coast ports, undergoing repairs and modifications, and conducting exercises with the 1st Fleet. On 29 November 1965, however, she headed back to the western pacific for the first deployment during which her primary mission was to support the American and South Vietnamese forces fighting the communists. On that tour of duty, she served as the flagship for the Commander, Cruiser-Destroyer Group, 7th Fleet. In that capacity, the ship operated in the South China Sea and in the Gulf of Tonkin providing naval gunfire support for the troops ashore and supporting carrier air operations by conducting search and rescue missions for downed air crews. She punctuated tours of duty in the combat zone with port visits to Yokosuka, Japan; Hong Kong; and the Philippine ports of Manila and Subic Bay. Her six-month deployment ended on 28 May 1966 when Topeka reentered Long Beach. Five months of normal west coast operations â€” upkeep, training exercises, and the like â€” followed. 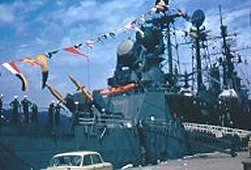 On 31 October 1966, the guided missile cruiser entered Hunter's Point Naval Shipyard in San Francisco for an overhaul during which her weapons systems were updated; and her engineering plant was overhauled. On 13 March 1967, she completed the yard overhaul and began sea trials and, later, refresher training. She finished those evolutionâ€™s early in June and resumed local operations. On 1 August, the warship put to sea from Long Beach for her first deployment to the Mediterranean Sea. She stopped at Norfolk on 12 and 13 August to embark the Commander, Cruiser-Destroyer Flotilla 12, and his staff and then sailed for Palm de Majorca on the 14th. 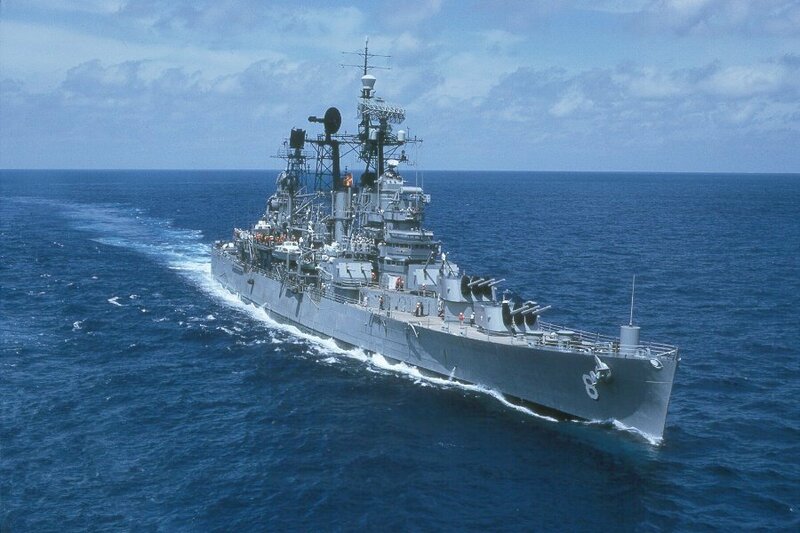 On the 20th, Topeka joined the 6th Fleet and, on the 22d, relieved Galveston (CLG 3) as flagship for TG 60.2. During her five months with the 6th Fleet, she ranged the length of the "middle sea." In late September and early October, the warship participated in NATO exercise "Eager Beaver," conducted in the eastern end of the Mediterranean. In mid-October, she-conducted operations in the Ionian and Tyrrhenian Seas on her way back to the western end. In January 1968, she concluded her first tour of duty in the Mediterranean with another NATO exercise -- this one an amphibious operation. On the 12th, she was relieved by Columbus (CG 12) at Rota, Spain. The cruiser then headed back to the United States. After stops at Puerto Rico and in the Canal Zone, Topeka reentered Long Beach on 29 January. On 2 February, the warship began a five-week availability at the Long Beach Naval Shipyard. The guided-missile cruiser departed Long Beach again on 15 March, bound for her new home port, Mayport, Fla. After arriving at her destination on 21 March, Topeka remained in port for upkeep until 6 May when she returned to sea for refresher training at Guantanamo Bay, Cuba. Returning to Mayport on the 26th, the ship began preparations for another deployment to the Mediterranean â€” the last deployment of her career. Topeka departed Mayport on 29 June and, after gunnery exercises at Culebra Island near Puerto Rico, she headed across the Atlantic. On 9 July, she relieved Columbus at Malaga, Spain, and began 6th Fleet operations. The warshipâ€™s final deployment proved to be routine in nature. She visited ports all along the Mediterranean littoral and conducted operations in all portions of the middle sea from the Aegean and Ionian Seas in the east to the Riviera ports in the west. Spain, Italy, Greece, Turkey, and France â€” as well as the islands of Malta, Crete, and Majorca â€” provided her with interesting ports of call. Topeka concluded her assignment with the 6th Fleet on 9 December at Rota when she was relieved once again by Columbus. That same day, she headed for Mayport, arriving 10 days later. On 30 January 1969, Topeka steamed out of May-port and proceeded north for inactivation. After a stop at Yorktown, Va., to off-load her ordnance, she arrived in Boston on 5 February. There, she completed inactivation preparations; and, on 5 June, Topeka was placed out of commission. The warship was towed to Philadelphia and was berthed with the reserve fleet group there. On 1 December 1973, her name was struck from the Navy list; and, on 20 March 1975, she was sold to the Southern Scrap Material Co., Ltd., for scrapping. Topeka was awarded two battle stars for her World War II service and three battle stars for her Vietnam service.